When Devon Owens checked his then 2-year-old daughter, Dallas, into the hospital last year, he wasn't sure what to expect. He just knew that routine medical tests had found her blood contained nearly six times more lead than what the U.S. Centers for Disease Control and Prevention considers safe. Today, after Dallas' 19-day hospital stay and frequent return visits, Owens is well-acquainted with the dangers posed by lead paint. Like hundreds of thousands of other children, his daughter now faces a lifelong risk of everything from a lower IQ to greater hyperactivity to violent behavior. So why, he wants to know, have funds for the CDC's Lead Poisoning Prevention Program just been cut 93 percent? "It's terrible that they are taking away that money," said Owens. "They wonder why kids out there are not learning properly. There's now going to be a lot of sick kids." Owens is not alone in his frustration. "I think this is really ill-advised," said Dr. Philip Landrigan, chairman of the department of preventative medicine at the Mount Sinai School of Medicine in New York City. "Lead is toxic to the developing brain at extremely low levels that 5 to 10 years ago were thought to be safe." Coincidently, a CDC advisory panel recommended in January that the threshold at which a child is deemed to have lead poisoning should be cut in half, from 10 micrograms per deciliter of blood to 5. Dallas' level last year before being admitted to the hospital: 58 micrograms. If the CDC accepts the panel's recommendation, the number of children diagnosed with elevated blood lead would nearly double to around 450,000. "This is exactly the wrong time to be cutting lead poisoning control programs," Landrigan said. CDC's funding for lead poisoning prevention -- down to $2 million this year from $29.2 million last year -- is primarily funneled to state health departments for childhood screening, education programs and data collection. Another large chunk of money comes from the U.S. Department of Housing and Urban Development. This support for cities, counties and states to get lead hazards out of homes has also shrunk in recent years. Further, HUD-supported work often relies on data from CDC programs. Bernadette Burden, a CDC spokeswoman, told The Huffington Post that state funds are secure into September, and noted that her agency will "continue to work on preventing childhood lead poisoning to the degree possible with available funding." Meanwhile, advocacy groups are fighting to keep the money flowing beyond this fall. Ruth Ann Norton, executer director of the nonprofit Coalition to End Childhood Lead Poisoning, met yesterday with Sen. Sheldon Whitehouse (D-R.I.) and continues to work with other senators who support the need to restore funding. The use of lead in household paint peaked prior to 1950. A final ban went into effect in 1978. Older, less well-maintained homes are therefore most risky — like the one in which Dallas has spent so much time. Not long after her initial stay at Mount Washington Pediatric Hospital in Baltimore, Dallas had to be readmitted. "Her lead went right back up," recalled Owens. "Where her mother lives, there is lead paint everywhere." 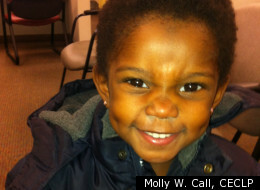 Owens and his daughter, who turned 3 on Friday, are now staying in a lead-free home, thanks to help from Norton's coalition. But when he goes to work, Dallas still has to go back to her mother's home. Her blood lead levels remain between 20 and 30 micrograms as a result. Baltimore's lead hazard abatement program does have plans to remove the lead from the home. "We wanted to start early so that we're not fixing the house after the kid has already been lead-poisoned," said Berg, who led the study published this month. The program is part of a multifaceted, citywide effort, funded by the CDC and HUD. As a result, lead poisioning rates in St. Louis have dropped from one of every four children to less than 2 percent. Yet an estimated 38 million homes in the U.S. still wear lead-based paint. And the consequences go beyond children. Norton translated what it means for society: "Consider a child who gets to third grade and can't meet reading scores," she said. "Those scores are what we use in public policy to predict the number of jail cell beds we need." Kids poisoned by lead are seven times more likely to drop out of school, said Norton. They earn less money, cost more in taxpayer dollars and provide less in tax revenue. On the other hand, each dollar invested in lead paint hazard control results in a return of $17 to $221, according to the U.S. Economic Policy institute. The bottom line, said Norton: "This has been one of the greatest public health success stories. If we don't continue to invest, it will be one of the greatest tragedies."